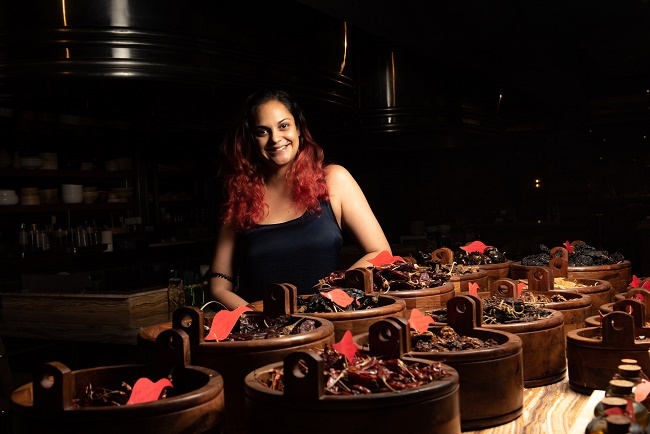 You cannot help but notice the red-haired woman behind the bar counter at Rika, a popular South Asian restaurant at Hyderabad’s Park Hyatt. Not just for her radiant personality and the beetroot red ends of her hair, but the unique way in which she concocts custom-made drinks for her customers. Swinging her hands in the air with glasses cupped over each other, juggling ice cubes in rhythm, Roxanne Read, a mixologist from South Africa, has grabbed quite a few eyeballs among regular pub-goers in the city. Born and brought up in South Africa, Roxanne worked and travelled in nine different countries before she landed in Hyderabad seven months ago. A mixologist by profession and probably one of the very few female bartenders in the city (if not the only one), Roxanne says she never had to apply for a job as work beckoned to her from around the globe just by word of mouth. “The journey began 14 years ago when I had just finished my course in film producing and acting in South Africa. One evening, while I was at a bar with my friends, I saw bartenders behind the counter cutting fresh fruits and preparing colourful concoctions. In Africa, parents throw you out of home once you finish college and I was on the lookout for a job. I went up to the counter and said I wanted to work with them as a bartender. The guys were quite amazed and said it’s a high stamina industry and that girls can never make it. All I could hear was men challenging me and I took up the job in the same pub with the same guys. After a few months, I realised I had a flair for preparing combinations and ever since I have been unstoppable,” Roxanne narrates. 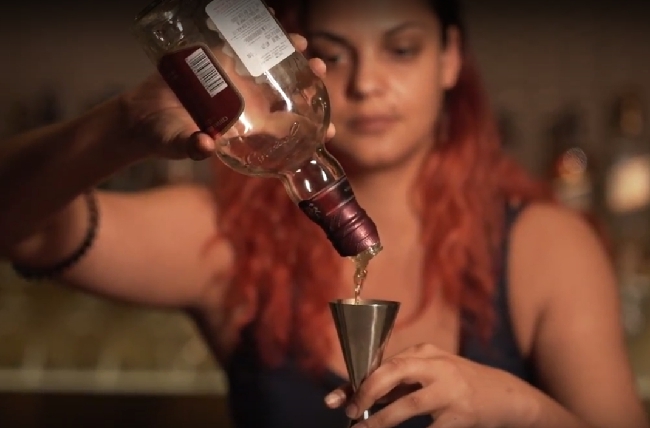 There is an obvious difference between bartending and mixology, explains Roxanne. While bartending caters to mixing drinks following set recipes, mixology is an art that one perfects after numerous trials and errors. “Mixology is all about the aesthetics of presentation. A piece of orange is a canvas for us. We experiment with colours and tastes with a lot of emphasis on its visual appeal. It has become so much of an art form now that we have schools that teach you the science of mixology. But when I started, it was all about putting citrus into Old Monk and then realising oops! that doesn’t work that way,” Roxanne laughs. 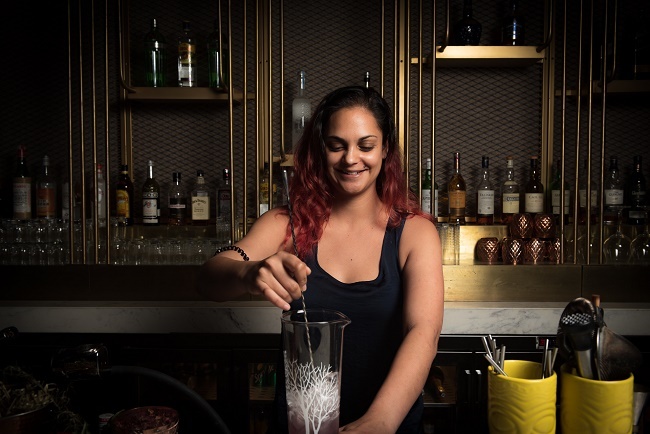 Travelling across the globe, Hyderabad is Roxanne’s ninth destination and in less than two months, she will be flying to the Caribbean, which she says, is the dream destination for any mixologist. “Each time my contract at a particular restaurant expires, I plan to wrap up, travel back home and relax. But before I can even start thinking of taking up a new job, I get a new offer from a new country and the next thing I know is I am packing my bags!” Roxanne says. Roxanne considers herself lucky because every city that has called out to her has given her ample opportunities to introduce the pub-goers of the place to splendid varieties of concoctions and drinks. “My personal favourite is the secret garden, a seasonal thirst quencher made of rum. 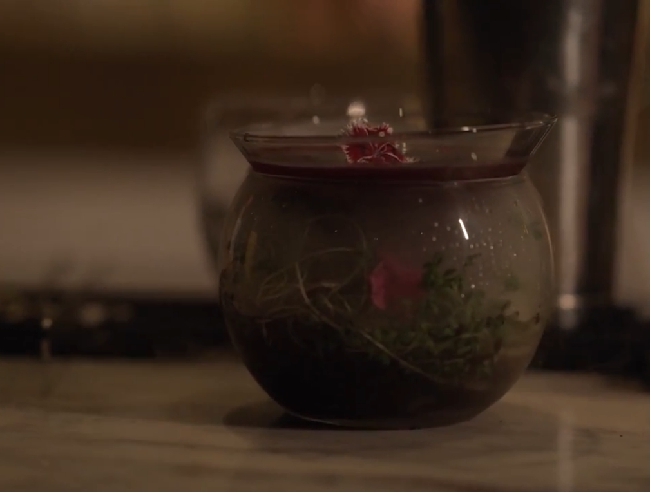 The drink came out of my fascination for ‘Alice in Wonderland’, and I try to present the drink similar to the fantasy forest in the story,” says Roxanne. As Roxanne mixes and shakes the drink in a cocktail shaker, one cannot help but notice her swift fingers that rock the cups in a fast-paced rhythm, moves that seem choreographed even to a layperson's eyes. The outcome is beautiful as she pours the maroonish-red drink in a martini glass. After having worked under several mentors including renowned mixologist Kurt Schlechter, Roxanne says that serving drinks to sloshed customers is no cakewalk. Once you perfect the art of mixology, the job is all about initiating conversations with customers and knowing their likes and dislikes, she adds. “Every city I have worked in has been at the cusp of experimenting with mixology. Though such places let you experiment with flavours, it is difficult to convince customers to try varieties because people are now more particular about what is in their cup than what is on their plate. Some say they don’t want their drink to be too sweet while some say they just want it perfect! And one never knows what’s perfect for the other person. Some just want their drinks to be colourful. In India, people are particular about each and every detail of their drink and there is an initial resistance at trying out new flavours. It is difficult to handle such crowds but at the same time that’s what makes the job more challenging,” Roxanne says.